Have you ever wondered why Matthew, Mark, Luke and John wrote the books we call the gospels? We might say they wanted to write a biography of a man they knew and admired – but to be honest, if that’s what they were trying to do, they didn’t do a great job. I mean, for example, Mark starts when Jesus is 30 years old. He leaves loads of questions unanswered – where was Jesus from? What was he doing for most of his life? Mark tells us almost nothing about Jesus’ family – we don’t even know what he did to earn a living before his ministry. Some biography! I doubt anyone will write a biography about me, but unless Jesus returns before then, someone will say something about me at my funeral. And I hope they do a better job at telling my life story than Mark – who starts three years before Jesus died. You see, Mark wasn’t trying to write a biography of Jesus. Sure, he includes a load of stuff Jesus said and did, but he doesn’t include everything. He misses out the parable of the Lost Sheep, the sermon on the mount, the Lord’s Prayer – pretty important stuff! No – Mark wasn’t trying to write a complete history of Jesus’ life. Instead, he was answering a simple question: Who is Jesus? Show the NYC street survey video. That video is on our website, in the ‘Who is Jesus?’ section. Those pages contain a brief presentation of the gospel that may help you talk to your friends and family. Or, maybe simply give them the link and be ready to talk to them about it afterwards. If that is the question Mark was trying to answer, the way he chose to answer it wasn’t to write an essay, but to show us who Jesus is. 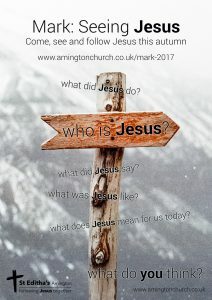 Come and see, Mark says; come and see this Jesus, come and see how he changed the world – and then you might want to follow him, to learn from him, to become one of his disciples. So I have called this series ‘Seeing Jesus’. Starting today we will be working our way through the first half of Mark’s gospel, with a break for Christmas. I love Mark’s gospel. And I loved the way Sam, Daniel and Joanna brought it to life last week for us. Mark has a way of moving quickly from one thing to the next, telling us about this thing Jesus did, that thing he said, this place he went to, how he got there – Mark doesn’t pause for breath. He wants to get it all out, he is so eager to tell us the answer to the question. In fact, he gives the ending away right at the beginning; he tells us the answer before we even get going with the story. Mark begins with John the Baptist – a bit of a weirdo – who lived in the desert, announcing that something big was about to happen, and baptising people in the River Jordan, telling them they need to repent of their sins. All of a sudden, Jesus came from Nazareth in Galilee and was baptised by John in the Jordan (9). 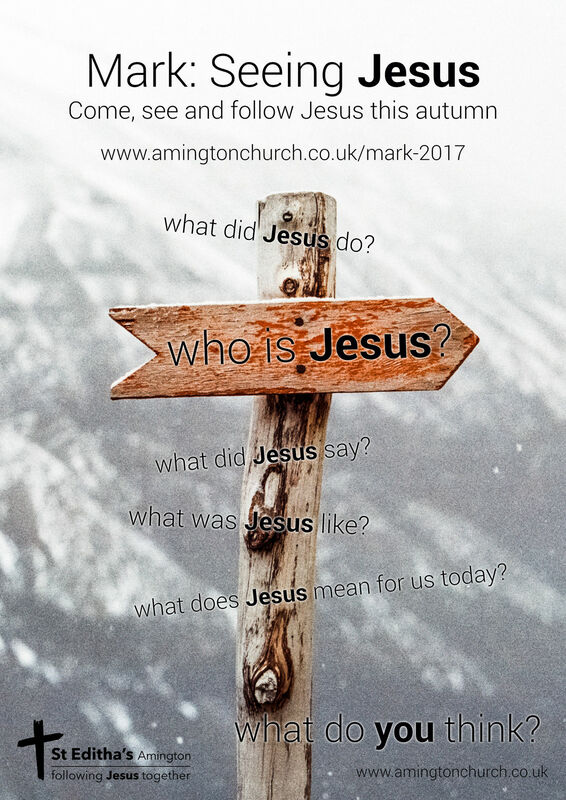 How Jesus heard about John, why he came at that moment, whether he was with his family, in a group or on his own – even how old he was (Luke tells us Jesus was ‘about 30’ – Luke 3.23) – Mark doesn’t care about any of that, because he wants to get straight to the good stuff. There. Spoilers in verse 11. Mark gives away the ending before he’s even got going. Who is Jesus? He’s (1) the Son of God, (2) loved by his Father, (3) who is really pleased with him. The rest of Mark’s gospel is showing his readers what that means, inviting us to see Jesus in action, so we might respond to him. This is the foundation: as he begins his ministry, Jesus is not given a task by God, he is not given a goal, a set of things to achieve – he is told who he is. What he came to do and say is of course important – but what’s most important, the foundation of Jesus’ ministry, is who he is. Remember: Jesus hadn’t done anything yet! His ministry hadn’t begun. He had no disciples, he hadn’t healed anyone or done any teaching yet. And yet God loves him and is pleased with him. So who Jesus is, is the most important thing – even more important than what he said or what he did. On your flyers are some questions – what did Jesus do? What did Jesus say? What was Jesus like? What does Jesus mean for us today? They are all good questions, and Mark explores all of them. But the most important question is the one in the middle of your flyers: who is Jesus? That’s the one Mark really cares about. You’ll also notice, at the bottom of your flyers is another question: what do you think? Coming round now are some slips of paper and some pens. I would like you all to take a couple of minutes to think about your answer to that question, and write it in the box provided. Who is Jesus to you? Who do you think he is (or was)? Give a few minutes for people to fill in their slips of paper. Gather them in and hold them all up. These are your answers to the question who is Jesus? Over the next few weeks we will start to look at how Mark answers that question. We will see, time and again that Mark believes Jesus to be God’s own Son, the Messiah, God’s chosen and anointed one – with the authority to teach, heal, cast out demons – and much more besides. Mark’s gospel has a simple purpose: to help us see Jesus, so we might come to him and follow him. I hope you are ready to journey together deep into Mark’s gospel, see who Jesus is, not only then, but now as well, so we can learn from him and follow him, together.